This neighbour of ours lived alone – her kids had worked abroad, eventually settling in the States – and every so often she’d come round to babysit, armed with a plate of dark, chewy brownies. I don’t know if it was something to do with the seeming exoticism of her far flung family, but I always associated these treats with America. I knew they were brownies, but their crisp crust and chewy texture felt a far cry from the cakier, fudgey version I sometimes made with my Mum. 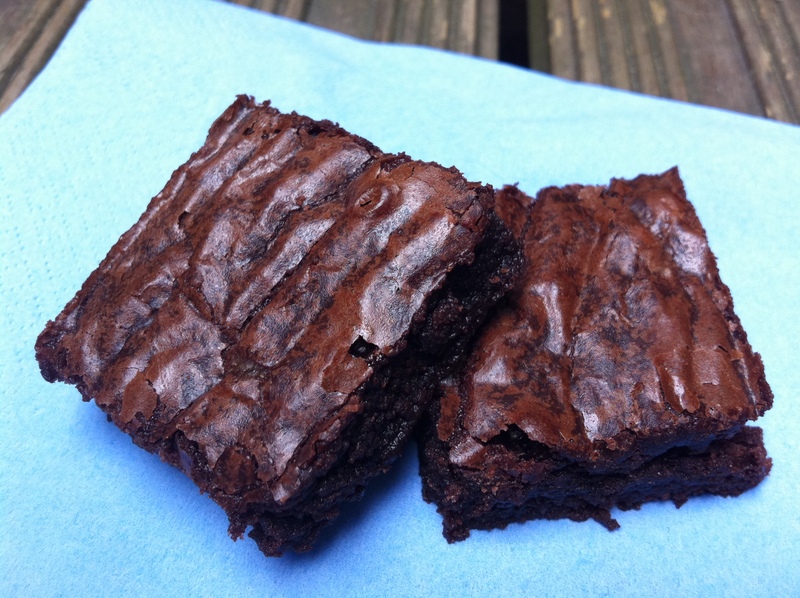 Crispy & chewy – is this the ultimate brownie? In hindsight I have a feeling they may have been made with Betty Crocker instant brownie mix, but at the time I wasn’t such a baking snob. I loved the chewy texture, the shiny, flaky crust and dense, muddy middle, the way they stuck to the roof of your mouth and retained an imprint of your teeth after you’d taken a big bite. More cookie than cake-like, they definitely weren’t my Mum’s brownies, but they were good. And so goes the age-old brownie debate; the crumbly, cakey crowd vs. those who prefer a dense, more fudgey fix. In The Perfect Scoop, one of my favourite dessert books ever, David Lebowitz acknowledges this fact by providing recipes for both camps, and in her ‘Perfect…’ column for The Guardian, Felicity Cloake provides more rigorous research into the various opinions out there than I’m going to go into here. Suffice to say, I’m torn between camps; while I’m always searching for that perfect brownie recipe, part of me thinks there should be more than one to suit different occasions, from lighter tea-time treats to giant, brick-like slabs (I’m thinking Flour Power’s Ultra Chocolate Brownie here). Nonetheless, when I saw that Signe Johansen had posted her version of the ultimate all-American brownie on her blog, I had to give it a go. Her ultimate chocolate chip cookies are my go-to cookie recipe and, when it comes to baking, I think she’s bang on the money. This recipe is adapted from The Fannie Farmer Cookbook, in which the eponymous Fannie is credited with inventing brownies back in 1896 by reducing the amount of flour in her chocolate cake recipe to produce something more akin to cookie than cake. The creditials are there – her recipe is certainly the original, but is it the best? Signe’s recipe goes steady on the sugar, ups the cocoa content and, unusually, contains a generous dollop of chocolate spread. 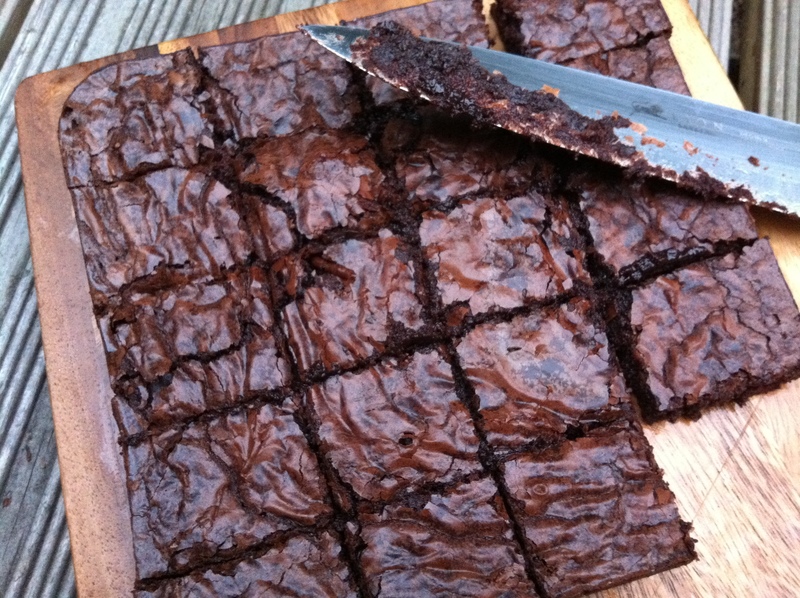 The resulting brownie is rich and chewy, the thin shiny crust flaking beautifully as you bite in to reveal a treacly slick of brownie beneath. It reminds me a lot of those brownies our neighbour used to bring round all those years ago, the sweet chocolate spread giving it a slightly candy-like flavour; one friend even asked if I’d used Nesquik in the batter (sorry Signe!). The verdict? If I’m completely honest, I think I slightly prefer the nutty undertones of golden to icing sugar, and would like to see a little melted chocolate going into the mix, but for an all-American classic, chewy brownie, this recipe is going to be hard to beat. What’s your favourite brownie recipe? Do you like them dark and earthy, light and crumbly or rich and fudgey? Or are you more like me, a brownie addict striving for perfection, but more than happy to do a lot of tasting along the way…? Preheat the oven to 150 degrees C. Grease and line a 20 cm square baking tin. Melt the butter then stir in the cocoa powder and chocolate hazelnut spread til smooth. Set aside. In the meantime, whisk together the eggs and sugar, making sure you don’t incorporate too much air into the mixture. Add the chocolate-hazelnut butter mixture and stir til smooth. Fold in the flour, vanilla extract and salt with a large metal spoon. Your batter should look dark and treacle-y. Pour into the prepared tin and bake on the middle shelf of the oven for 20-25 minutes. It’s always better to remove brownies from the oven sooner rather than later – check them after 20 mins or so and if a firm crust has formed, remove. Another way of checking if they are done is to insert a skewer in the middle – little bits of gooey crumb should still cling to it when removed, but not a complete sticky mess. I wouldn’t have thought of using chocolate spread rather than chocolate – I think I’m with you that I would prefer to use the real stuff but the texture of these brownies looks pretty amazing. I prefer the more fudgy type of brownie myself, I love the gooiness of them! Signe – comparing this recipe with dozens of others must have been a horrendous task. All that brownie tasting… 🙂 Really looking forward to trying your pure chocolate version too – will be interested to see how it compares to the classic recipe my Mum always uses. I am a chocoholic and American so I love my brownies and take them very seriously. Funnily enough my go-to brownie recipe is Nigella’s. These brownies are not made with cocoa powder but melted chocolate and they have walnuts in them, a must for me. I like my brownies rich and fudgy but am always happy to taste a new one. Love the addition of Nutella in these recipes. I like my brownies dense and fudgey, without nuts preferably. A slightly crispy outer coating is always good too. Fab blog, discovered it through The Twice Bittens blog recently. Thank you 🙂 Crisp, dense and fudgey sounds pretty perfect to me! Oh gosh, I remember my mother making boxed brownie mix, and how much of a treat it was. I can’t tell you the last time I had a brownie like that — fudgey in the middle, with that beautiful shiny crust on top. These look like the perfect homemade version of those brownies I used to stare longingly at while they cooled (the Nutella of course takes it over the top, though — yum). You’ve made me feel so nostalgic! Thanks 🙂 The addition of blueberries or raspberries sounds delicious – do you just bake the fresh fruit straight into the brownie batter? brownies are one of my most loved treats ever. and my mother still makes them when i visit home and it also evokes precious childhood memories… ah, good times! mhh, and hey, i’m german so i also love nutella! they really look gooey and great, littleloaf! These look like heaven, can’t get over how beautiful they look. Can’t wait to try these… and you used nutella as an ingredient, I know its gonne be great! I made these at the weekend – they’re brilliant! Well done Little Loaf, loving your blog.